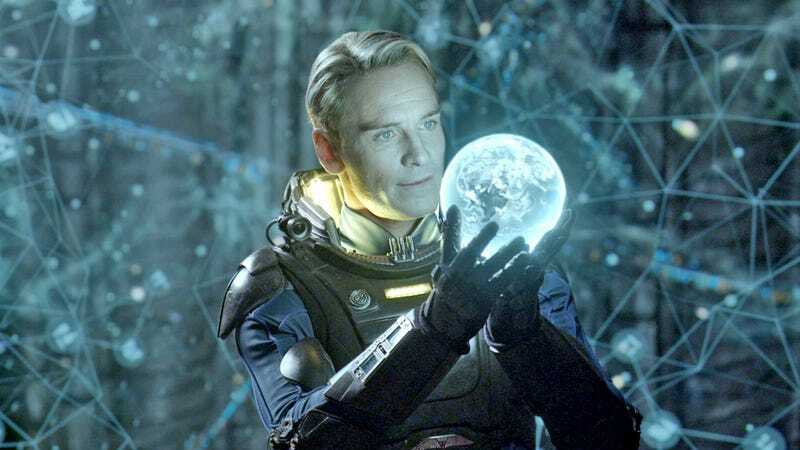 Prometheus 2 Could Feature A Lot More Michael Fassbender. A Lot. Interest? Restored. Apparently, the Untitled Ridley Scott Project coming out in March 2016, which everybody has been wondering about, really is Prometheus 2, or whatever it'll end up being called. And it'll have the most Michael Fassbender of any movie, ever. According to The Wrap, Michael Green (who co-wrote Green Lantern) is rewriting the Prometheus 2 screenplay, which was originally written by Transcendence scribe Jack Paglen. Green also just got done writing a draft of the Blade Runner 2 script for Scott. The good news? The Wrap says "the sequel that Green will write aims to be much more "alien-y" and in line with the terrifying tone of past films in the franchise. Additionally, the sequel is expected to feature multiple 'David' androids, which means there will be more than one Michael Fassbender on screen at the same time, according to an individual familiar with the project." And the sequel will probably also pick up on the other dangling plot threads from the first movie, including Liz Shaw on her way to the Engineer homeworld, and the chestburster bursting out of an Engineer's chest. It sounds kind of promising, although obviously we had our hopes raised before. Mostly in this for the scenes where Michael Fassbender and Michael Fassbender share a special moment together.